ABSTRACT: The fish disease marine flexibacteriosis is characterised by necrotic lesions on the body, head, fins, and occasionally gills, with erosive lesions on the external surface as the prominent clinical sign. In Australia, the main species affected are Atlantic salmon Salmo salar and rainbow trout Oncorhynchus mykiss in sea-cage culture in Tasmania. Using a dose-dependent trial to determine pathology, 2 forms of the disease were noted in Atlantic salmon. The acute form occurs within 2 to 3 d after inoculation at high doses (1 × 108 cells ml–1) and is characterised by the disintegration of the epithelium. The chronic form of the disease began as small superficial blisters of the epidermis, which develop into ulcerative lesions that leave musculature exposed. The predominant lesion sites were the dorsum and pectoral fins. Jaws were commonly affected, and gill necrosis was also noted. Behaviour of Atlantic salmon as well as the conditions under which they were kept contribute to the size and distribution of lesions observed. Lack of an inflammatory response in pathology and rapid and destructive mortalities observed in higher inoculum doses suggested a role of toxins in the pathogenesis of Tenacibaculum maritimum. 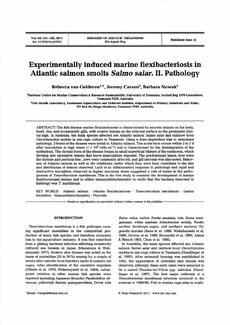 This is the first study to examine the development of marine flexibacteriosis lesions and to utilise immunohistochemistry to verify that the bacteria observed in histology was T. maritimum.